Here is a free software to download subtitles by right-clicking on a TV show or movie. It is named as “SubChan“. 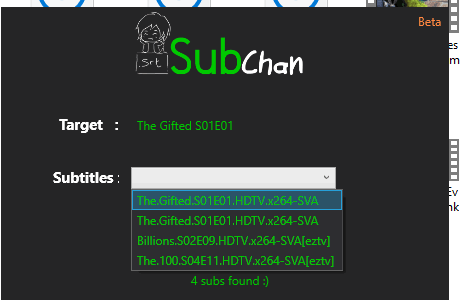 It shows the list of available subtitles for the selected TV show or movie and then you just need to click on any of those subtitles. After that, the subtitle file is downloaded automatically in the same location where your movie or TV show file is stored. The subtitles are saved as SRT format, which is a very popular file format for subtitles. It also supports many popular video file formats to download subtitles like MP4, MKV, etc. This is a simpler, if not simplest, subtitle downloader software I have come across. There are already many subtitle downloader software (check this list), command line tool, and websites also available but if you are looking for something easier, then you should give a try to this software. Above you can see some subtitle files downloaded by me for movies and TV show using this software. I wasn’t able to find the source from where it fetches subtitles but subtitles were good as there was proper syncing between video and subtitles. 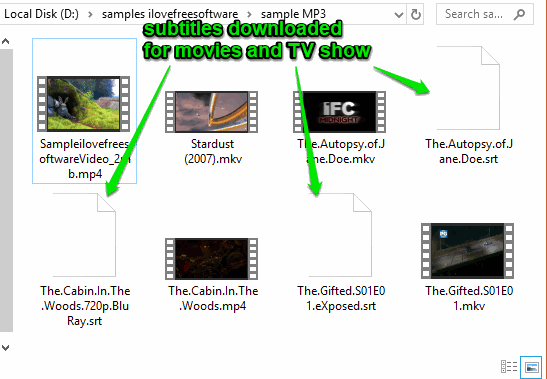 Note: This free movie and TV show subtitle downloader software is currently in beta version but it worked great for me. Also, currently it works for one TV show or movie at a time but it will also provide batch subtitle download feature soon. How To Download Subtitles By Right Clicking On A TV Show or Movie Using This Free Subtitle Downloader Software? This subtitle downloader doesn’t need any installation. 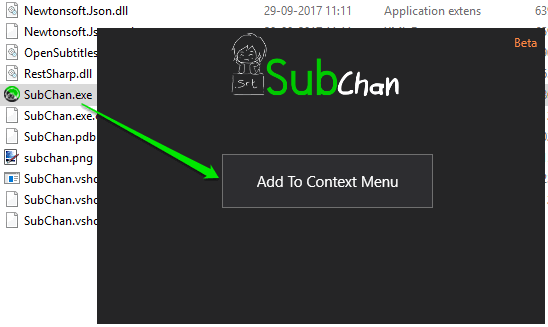 You need to integrate this subtitle download to right-click context menu of Windows. For that, download its zip file → extract that file → and double-click on SubChan.exe. A small box will open where you need to click on “Add To Context Menu” button. Once the software is integrated with Windows context menu, access the folder that contains your movies and TV shows. 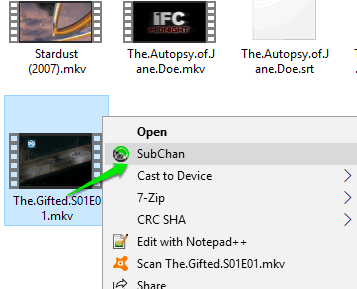 Right-click on a movie or TV and select “SubChan” option. A box will open where it will start searching for the subtitles. This process takes two to three seconds. After that, it will show the list of available subtitles in a drop-down menu. Select a particular subtitle and that’s it! The SRT file will be downloaded in the same location where your movies and TV shows are available. When the download is completed, you can close the box. Repeat the same process to download subtitles for some other TV show or movie. While a lot of other free subtitle downloader software can help you download subtitles for movies only, this software has the advantage that it can fetch subtitles for TV shows as well as movies. It will be more useful when it will come with batch subtitle download support. For now, you can enjoy this free subtitle downloader to grab subtitles for a TV show or movie at a time.